WordPress 5.0 is here, but users should be cautious of updating. Back in July, we presented you with the Gutenberg Roadmap as it was given by Matt Mullenweg in the State of the Word at WordCamp Europe. WordPress 5.0 was postponed until today, December 6th 2018. Despite the fact that WordPress updates are historically very stable, we strongly advise against updating anything before your holiday or end of the year campaigns are fully over. So far Gutenberg development has been — unpredictable. The Gutenberg plugin still is very impressive and will pave the way for a whole new way to understand WordPress. But it is quite literally, the biggest update made to WordPress ever. 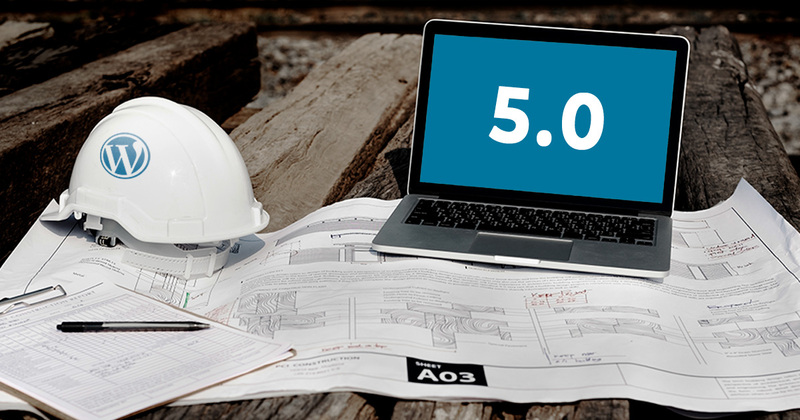 Things have constantly changed, and not all plugin and theme authors will have the opportunity to update their code immediately following the release of WordPress 5.0. That means if something breaks when you update WordPress, you might not get it fixed before someone tries to use your website. But fret not. Not only will these conflicts eventually get resolved, you can test your update on a staging site before you do it on your live site. Not all themes and plugins will be behind though. The Gutenberg team implemented a feature freeze on October 19th, committing to only fixing bugs and working out the kinds for the existing functionality of the 5.0 release candidate. Those companies that have team members contributing to Gutenberg or keeping them informed of its progress, will likely have most conflicts with their plugins and themes resolved prior to the release of WordPress 5.0. The trick is looking for themes and plugins from authors that are involved in the WordPress community. The development team has released a few rounds of beta versions of WordPress 5.0 over the past few weeks. This means that developers and website administrators can download and test an unstable version of the new WordPress Core software. We recommend testing any early release candidates on a staging environment before the official release of WordPress 5.0. By doing so you will have the opportunity to contribute to WordPress development and also ensure your site won’t break with the new update. First thing’s first. Never roll out big, new features on your live website without testing it first. To test new plugins, themes, or code alterations on your site, create a live staging website first. You can do so with a variety of methods. Here we’ll explain 2. The first is the most simple. Many hosting sites provide you with the ability to set up a staging environment through your cpanel or hosting dashboard. If you don’t know how your hosting service sets up staging environments, check their documentation or contact their support team. You can also set up a local development environment using something like ServerPress, or Local by Flywheel. Navigate to Plugins > Add New then search for “WP Time Capsule”. Install and activate that plugin. Connect your WP Time Capsule account in your Website. Go back to your WP Admin, navigate to the WP Time Capsule menu, and click on “Settings.” Login there with your WP Time Capsule credentials. It will ask you what timeframe you want your backups to run at — daily, late at night is probably best. WP Time Capsule creates backups incrementally. This is great for server resource issues. But in order to increment those backups, it first has to create your first full-site backup. This most likely will take quite a while. Luckily, you just need to get the process started, and come back much later when it’s done.WP Time Capsule also creates your staging environment based on that backup, so you’ll need that done before working with your staging environment. Once your first backup is created, navigate to WP Time Capsule > Staging and launch your new staging site. Start Testing your Staging Site. Because this is a LIVE environment, we recommend that you immediately install a free plugin called “Email Cop.” Email Cop ensures that NO emails will be sent from your live staging site, but also gives you a log to view all the emails that would have gone out. This prevents confusion with your users in case they get a stray email. You might also consider installing the “Coming Soon” plugin to lock down your staging site against live visitors.Once those two plugins are in place, test updating to WordPress 5.0! If all goes well on your staging environment, you can be assured it will go well with your live site as well. That’s confidence worth paying for! Overall, we are really excited for WordPress 5.0 and the new Gutenberg editor! Give’s Gutenberg block is ready to go and pretty exciting to use. But in light of the major changes coming through this update, we ask you to update wisely. Make sure you test WordPress 5.0 in a staging environment before updating your live site. Our support team will always be here for you, but it’s always best to keep a backup of your site handy in case anything goes wrong. And always test all major updates before you apply them. This article was updated on December 6th 2018. Matt is a co-author of Give and is Head of Support and Community Outreach for Impress.org. He loves writing docs and being "Generally helpful since birth".